Today I would like to start with the national costume of Miss V Turkey 2013. The “Miss Turkey 2013” gown was made by Kimmera Madison, owner and designer of Tres Beau. 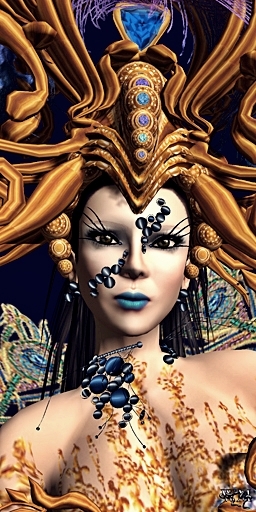 Tres Beau is one of the designers that contributes creations to the Miss Virtual World finale for years. What always amazes me on the Tres Beau national costumes, is that it seems Kimmer Madison does a hell of research for each country she gets asked. The colors, the textures, the designs are always go along the real traditional clothing of the respective country. The “Miss Turkey 2013” costume is textured with wonderful filigree and rich colors of gold and red. The wonderful ornaments show the love and the eye for the detail Kimmera puts on her creations. The body part of the gown is made of a wonderful mesh prim that you will get in different sizes to make sure it fits your shape as well. The wonderful flexible parts of the skirt and arms give the whole creation a typical traditional, oriental and turkish look. If you take a closer look of the 2 pictures you will see a difference for the headpiece. I wanted to showcase the gown with all its parts and as well the whole jewelry set, that Miss Nice Wildrose was wearing for the finale. You can get the “Miss Turkey 2013” costume at the Tres Beau Mainstore and the “Hurrem” jewelry you will find at the Chop Zuey Mainstore. I would like to lead your view on the hair I chose for this post. The “Desireme” hair was made by Leah McCullough. Leah reactivated her brand Naive and you can buy already a few different items including this hair style on Marketplace. The “Desireme” hair is available in 8 different colors. Leah made the hair modify so that you can change the color or the texture to your own likings. For the colors she provides she made hairbases as well, wich you can as well recolor to match the hair style. 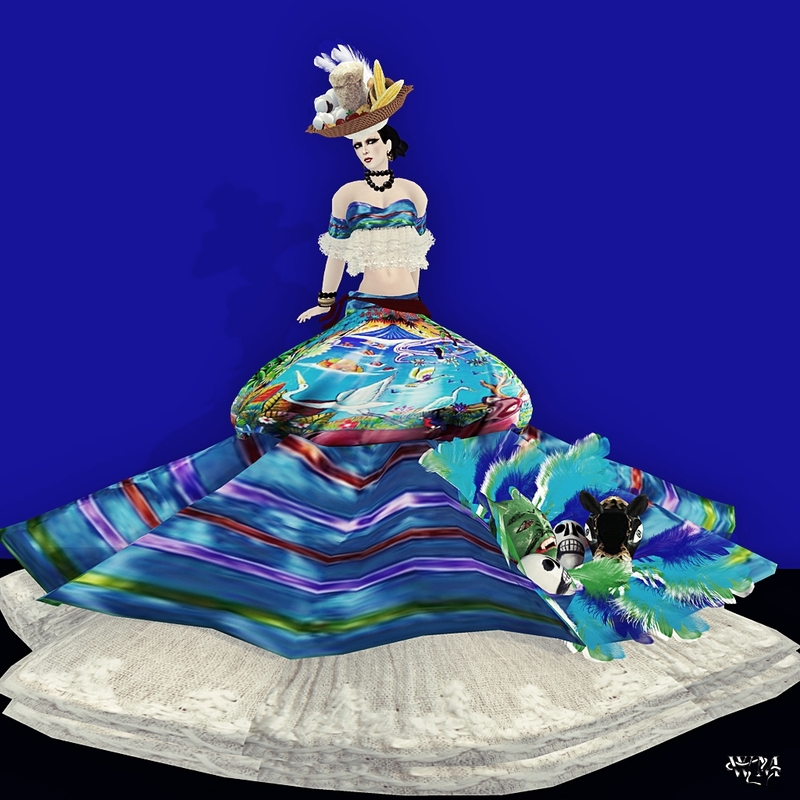 The wonderful and cute national costume for Miss Monaco 2012, Miss Vivienne Darcy, was made by Kimmera Madison, owner and designer of Tres Beau. Again Kimmera did a great research, to create this beautiful national costume for Miss Monaco 2012. Many traditional parts you can find on the “Miss Monaco” dress if you compare the outfit to google search results of traditional clothing of Monaco. 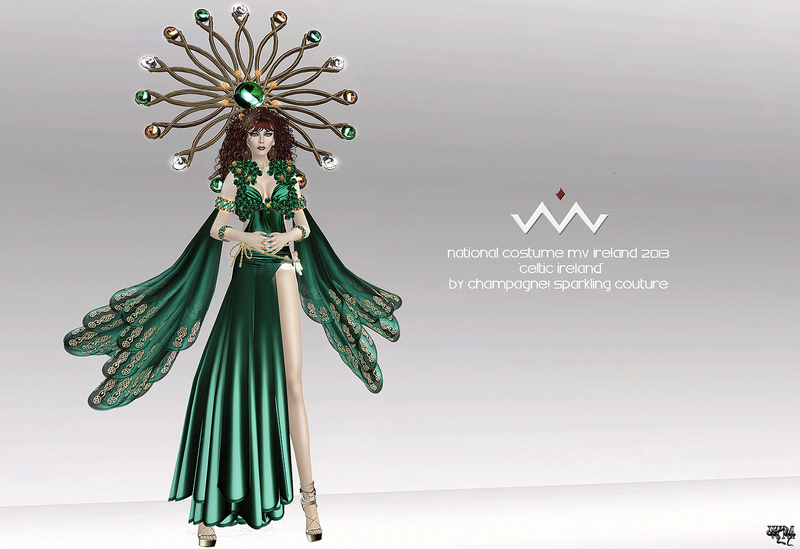 I admire Kimmera for her careful research, when she starts designing national costumes for Miss Virtual World. All of her creations have really a real based theme and you can discover the country from seeing the costume. The awesome love for the detail Kimmera puts in her creations you can see again at the “Miss Monaco” dress. 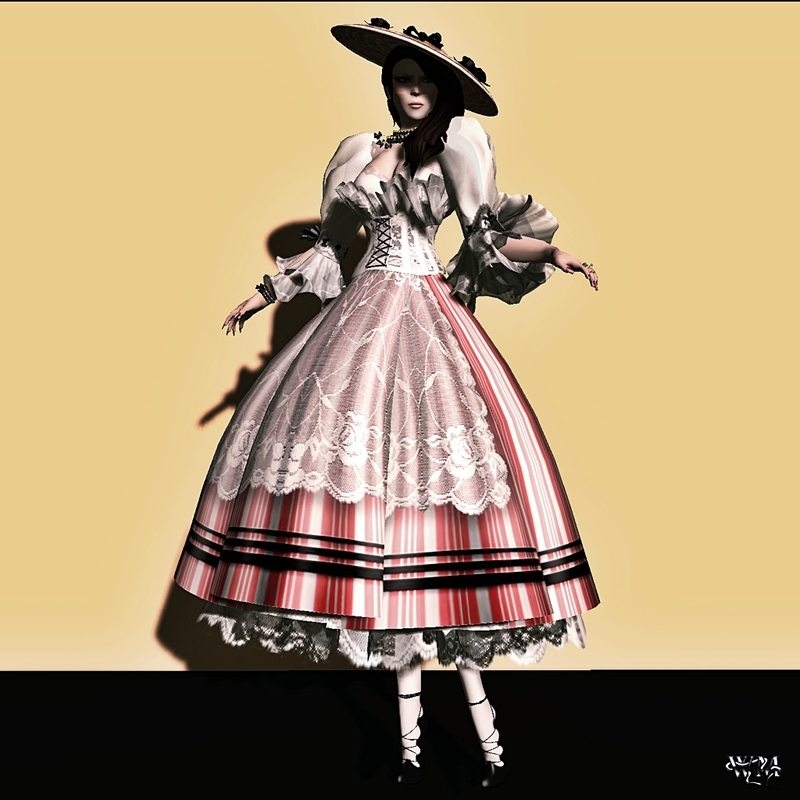 The ruffles, the delicate corset, the hat, the cute little black ribbons that are used for the blouse and the hat and all those amazing and perfect placed textures… that’s really high-class designing. The skirt carries a very filigree lace texture over the opaque basic and adds a touch of elegance as well. 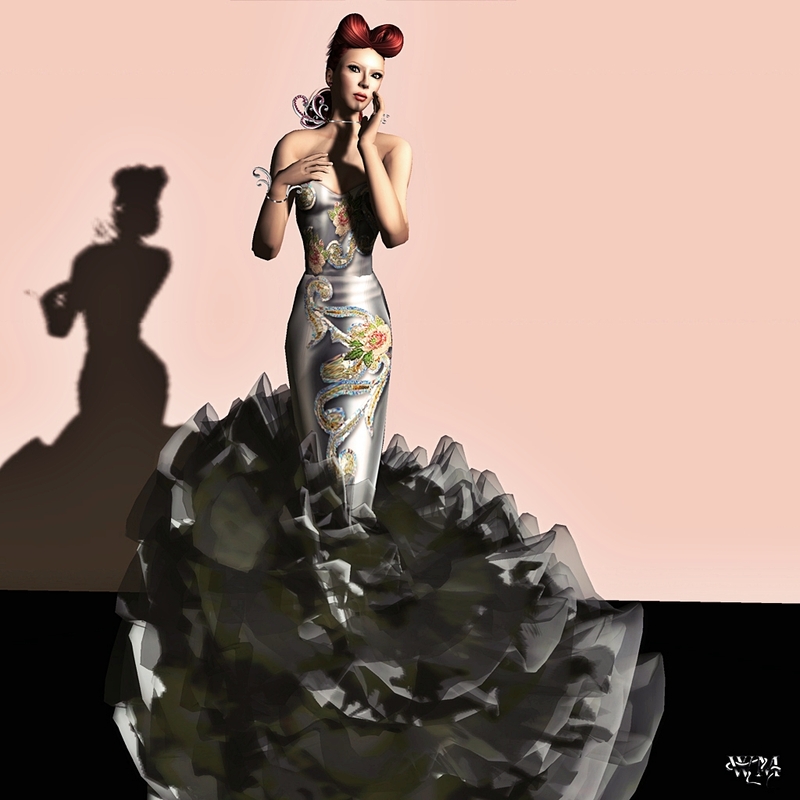 “Miss Monaco” now is available at the Tres Beau Mainstore. 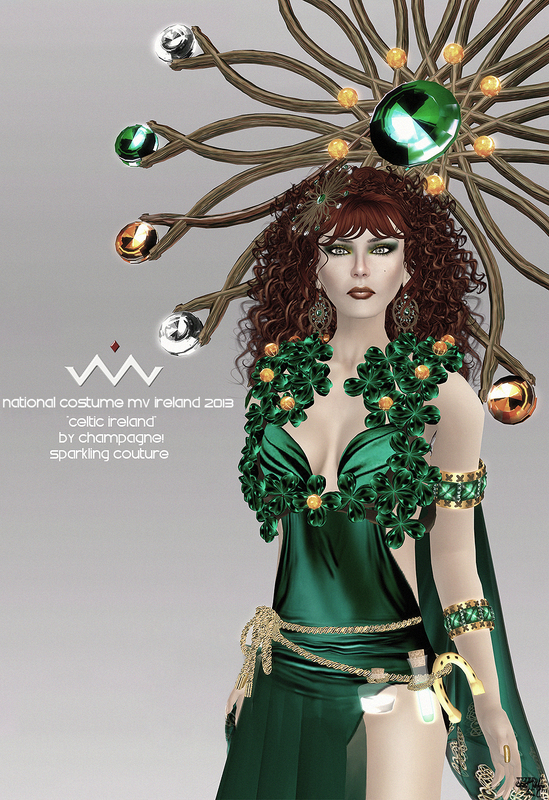 Nearly a full MVW 2012 design including hair and the wonderful jewelry shoulder piece, Miss Thailand 2012 got from Son!a. Sonia made a wonderful combination of dress, jewelry and as well the hair. The wonderful “Thailand Dress” of Miss DiamondGem Destiny is made in a very elegant way with really delicate fabrics. For my post I chose the golden version you can find some more colors at the Son!a Mainstore as well. The skirt parts left and right are made wonderful flexible, the basic fabric looks kinda satin and the wonderful laces ornaments at the bottom repeat the texture that was as well used for the skirt layer. The small top gives room for a lot of skin at the belly and the shoulders are amazingly covered by this huge jewelry part that goes down from the neck over both shoulders. The armlet and the bracelet are as well part of the “Thailand Dress”. The beautiful hair with jewelry part also, unbelievable but true, is part of the whole outfit too, that’s why I said in the beginning it was nearly a ready-made full outfit for Miss Thailand 2012 😉 I really only added the earrings, the hairbase, skin, nails and shoes. Everything else you can see you will get if you purchase your “Thailand Dress” at the Son!a Mainstore! The wonderful, playful and still elegant national costume for Miss Belgium 2012 was made by Champagne! Sparkling Fashion. The sweet accent this outfit has combining with the cute flowers with the red and yellow colors gives the whole out fit immediately a positive attitude. The corset is made with such nice, filigree details, the texture with the little ornaments… just amazing. The flower decoration at the cheat part goes so wonderful with the jewelry and the short skit underlines the cute look perfectly. “Belgium Ducasse” was for one of the most cute outfits for this year MVW 🙂 The “Belgium Ducasse” dress you will find at the Champagne! Sparkling Couture Mainstore. Panama, and I was not really able to. I tried to google a bit and found a few traditional costumes, that looked very close to the one Tres Beau did. Again was impressed on the research, Kimmera did to create this incredible and adorable costume. Panama is the southernmost country of Central America, and many different cultures and influences got settled down there. To get the exact information about that I recommend to take a look at Wikipedia, what I did too and why I should just copy information you can read at the place where it came from ;p (http://en.wikipedia.org/wiki/Panama) But I saw a lot of indian influences as well and some of those looked very close to the one Kimmera did 🙂 She really put a lot of work, love and eye for the detail on this costume. All this different fabrics like metal, feathers, delicate fabrics for the clothing layers… for me a again a masterpiece of art. First, as I put on that gown, I thought ‘omg how can I ever find a pose for that huge gown?! ?’ but I have to admit it was not that hard as I thought of… I kinda think Kimmera knows about that and she designs even the most huge looking gowns and costumes and you still can find poses to showcase them. The attachment points are chosen so very well that the gown moves naturally with every inch you move by yourself. For me that just underlines, that Tres Beau is one of the most popular and everlasting brands in SL for a reason 😉 “Miss Panama” is now available at the Tres Beau Mainstore. Miss Mely Gibbs chose an already existing set from Finesmith to complete her look. The “Coral Blossom” set sets an awesome blue accent as well with the necklace, the wonderful earrings and the stunning face ornament. All the wonderful round shaped gems picked up the theme for me and I think it was a good choices for the beautiful “Miss Panama” costume. Normally you have an awesome tiara as well that is included in the “Choral Blossom” it just would have got lost under that huge headpiece of the “Miss Panama” costume 😉 The “Coral Blossom” set you will find in different colors as well at the Finesmith Mainstore.